With the Black Crowes on hiatus, vocalist Chris Robinson saw the perfect opportunity to record a solo record. Spending time in Paris, New Earth Mud was conceived. An album as organic as the title suggests, it is filled with Robinson's trademark vocals, a voice that can transcend the simplest white boy blues song or acoustic folk offering into a sweeping ballad both gutsy and soulful. 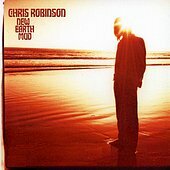 Forgoing the guitar-swimming rock of The Black Crowes, Robinson's voice is the main attraction here as he turns the simple and the delicate into the beautiful. The groove-laden "Ride", the rich soul of "Fables", and the jazz-pop of "Could You Really Love Me?" mark an artistic growth for Robinson, who hinted at something like these in the Black Crowes, but never fully realized. Here he not only attempts the cross-genre pollination, but succeeds without a doubt. This is a step in the right direction, a record that finds Robinson re-discovering his musical abilities, re-creating what it means to be a songwriter to him, and allows him to take changes without the hassle of a band. New Earth Mud is Robinson in full glory; he's never sounded so good. I'll give it an A-. Chris Richards: Pathetic History Chris Tsefalas: I'm All Right?